Strawberries require moist, warm soils for optimum growth, factors controlled most easily in a container. 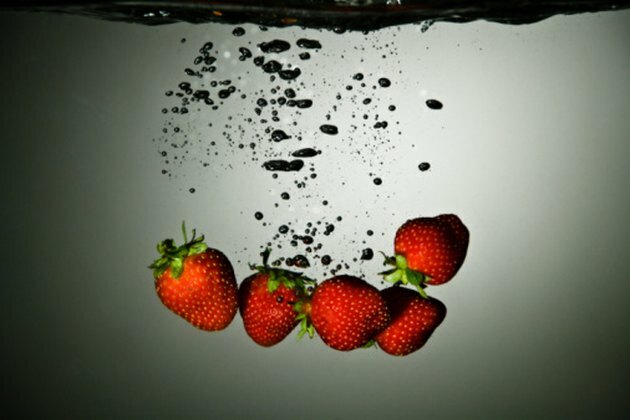 However, container-grown strawberries can tangle and overgrow themselves, causing rot and an unevenly ripe crop. You can solve this problem without purchasing trellises or fancy planting systems. All you need is some PVC pipe to build an original strawberry planter. PVC pipe makes a convenient planter for multiple strawberry plants. Clean your PVC pipe with mild soap and clean water. Rinse it thoroughly. This eliminates dirt and grime that might harm your strawberries if absorbed. The length of the pipe may be from 2 to 8 feet; this depends on your space restrictions. Hardware stores will cut the pipe for you at no extra cost. Place the pipe on a flat surface. Drill 4-inch holes in the pipe with your boring bit, spacing them about 6 inches apart. In a 12-inch pipe, you'll only get two holes. In an 8-foot pipe, you may have up to 16 holes. Drill one 2-inch hole between each of the 4-inch holes. These holes will allow you to water your plants and give excess water a place to evaporate. Run a bead of silicone caulk around one end of the pipe. Press a pipe cap into place. Let the caulk dry overnight. Do not cap the other end yet. Pour potting soil into your pipe until it's half full when lying on its side, with the holes facing up. Fit the cap on the other end; don't seal it, so you can empty the planter if necessary. Gently place one strawberry seedling in each hole. Cover the roots with soil through its planting hole. Screw two lantern-style L-brackets into a porch wall with steel screws. These brackets have a slight curve in the top arm, perfect for holding your pipe planter. Set the planter on the brackets.